Please refer to our stock # 7231 when inquiring. A Scheurich blue and brown Fat Lava German art pottery vase from the 1970s. 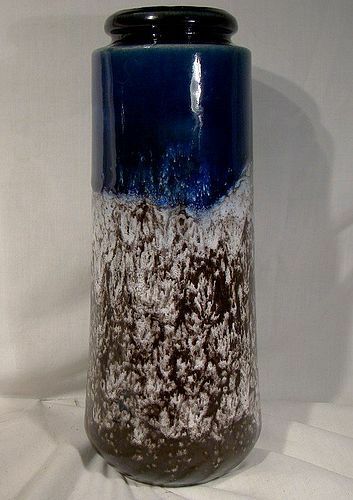 This 10-1/2" tall retro modern vase features an upper portion in deep blue glaze with an expanse of brown and white "lava" on the lower section. It is marked 206-26 W.GERMANY on the bottom and it would be a great accent for your retro decor. It is in excellent condition with no chips, cracks,losses, damage or repairs other than some allover crazing in the blue glaze only. All items are thoroughly and conservatively graded and all condition issues are noted; all items are vintage or antique and may have slight signs of gentle use. Small packet air shipping to the U.S. starts at $14.50 (other spots may vary). Items paid with a credit card will be shipped to confirmed addresses only. We do ship internationally. All of our prices are in $US. PLEASE NOTE: We DO NOT accept PayPal.